Adele Springsteen and Bruce Springsteen attend MusiCares Person Of The Year Honoring Bruce Springsteen at Los Angeles Convention Center on February 8, 2013 in Los Angeles, California. Adele celebrates her 93rd birthday in May. 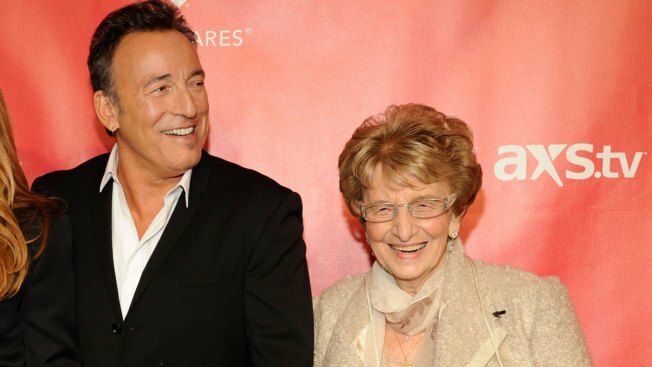 Bruce Springsteen treated his 92-year-old mother to an early birthday celebration before Mother Nature spoiled the party. The 68-year-old Boss and his mom, Adele, danced to two songs Sunday night at the Wonder Bar in Asbury Park, New Jersey before severe storms caused the club to lose power. They were there to see the Eddie Testa Band, reportedly one of Adele's favorite bands. Patrons say the Springsteens — along with the rocker's 24-year-old son Sam — were in the club for about 90 minutes.